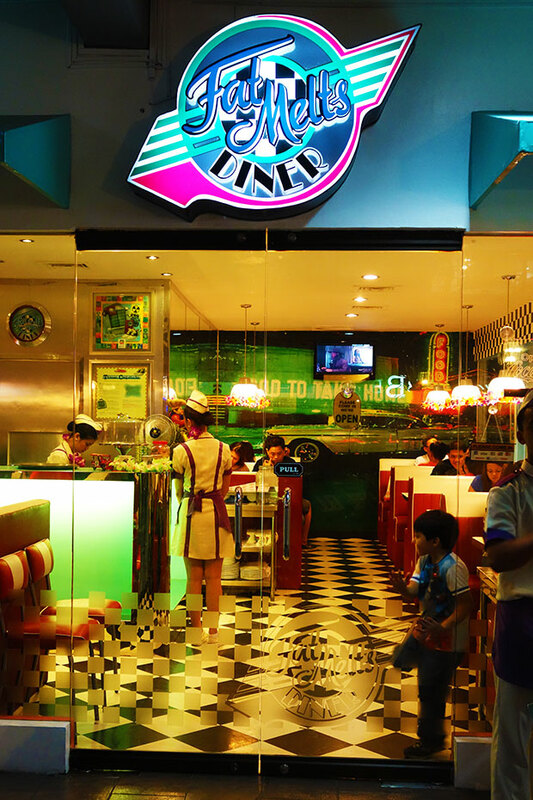 Last week my girlfriend and I ate at Fat Melts Diner, a small restaurant located at the Pergola Plaza in BF Homes in Parañaque City. 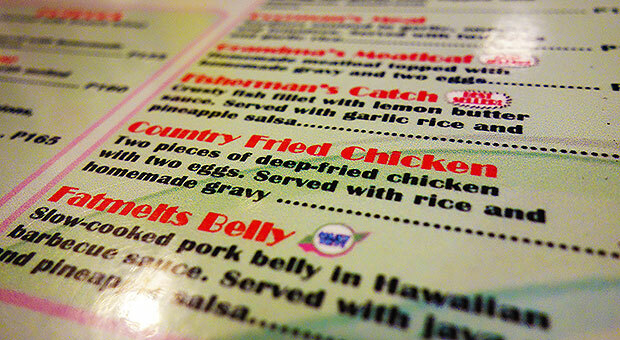 It’s one of our favorite comfort food restaurants in the South because of the good food and comfortable ambiance. I wanted to feature this restaurant as my first AFK post because, as previously mentioned, it is one of our favorites and I wanted to give it some exposure no matter how small. I also plan to post not only about restaurants and eateries but also movies, places, events, and other things I see, hear, do, or experience away from my computer. 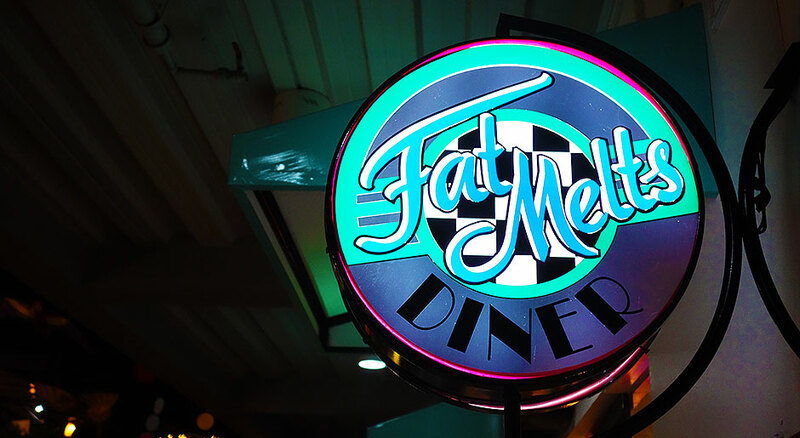 Fat Melts serves an array of diner and non-diner style dishes such as pancakes, burgers, sandwiches, pasta, rice dishes, shakes, floats, and ice cream. Their serving sizes vary per dish with some being on the smaller side and some that make you wonder how they’re making a profit out of. A good example would be their Fish and Chips which would serve more as a small appetizer than a full meal and their Country Fried Chicken which can probably feed two people. The restaurant isn’t that big and only has a number of booths that can sit up to 4 individuals (6 if you’re a group of really thin people) and a couple of long tables outside for bigger groups. I’ve tried most of their dishes but my favorite, and what I had last week, would be the aforementioned Country Fried Chicken due to the big serving size and flavor. 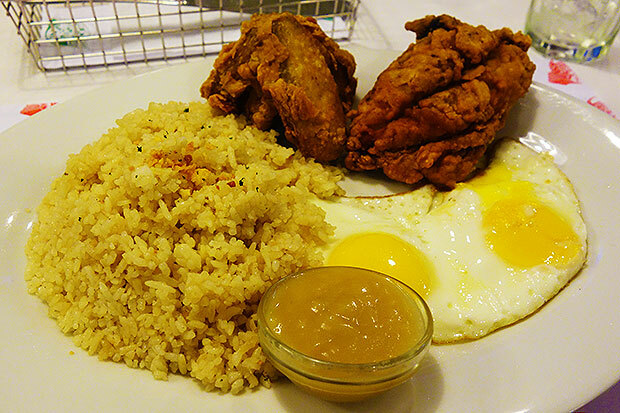 The dish comes with two pieces of fried chicken, two fried eggs (“sunny-side-up” for some of you), a side of gravy, and almost two cups of garlic fried rice. The fried chicken has audibly crispy skin and juicy meat, reminiscent of Pancake House’s Pan-fried Chiken but twice as much, and the garlic fried rice is the superior cooked in garlic infused oil variety and not one of those dry bland types that’s just a cup of white rice with a sprinkling of garlic bits on top. It’s one of the biggest meals on their menu and it only costs Php175.00. Some of the other dishes that also have big servings are the Nachos, the Angry Wings, and the Fatmelts Deal to name a few. Fat Melts is an establishment everyone from BF Homes, the South, and elsewhere should check out. I’ve yet to have a bad time there and it’s just a great place to not only have good food but also hang out with friends, family, and/or whoever. They’re open from around 7:00am up until 11:00pm.